Bob was born on 9 May 1936 to Robert W. and Dorothy I. (Rydquist) Garrison in Aurora, Illinois. He graduated from West Aurora High School, where he met his first wife, Ada V. Mighell, before serving in the US Marine Corps (1954-56). He then attended Earlham College (B.A. 1960 in Math), and was there influenced by Professor Clifford Crump to pursue a career in Astronomy. This led him to studying Physics at the University of Wisconsin (1960-61), and obtaining a Ph.D. in Astronomy at the University of Chicago (1966). It was during the Doctorate that his advisor at Yerkes Observatory, William W. Morgan, inspired him to his life’s work with the MK classification of stars. Bob held a postdoctoral fellowship at the Mount Wilson and Palomar Observatories in 1966-68, before joining the University of Toronto in 1968. There he served as Associate Director of the David Dunlap Observatory and for 28 years traveled to Chile as the Director of the University’s Southern Observatory. Bob was appointed a Professor Emeritus in 2001. Rudy Schild, a fellow graduate student and a later collaborator, remembers the heavy astrophysical bias at Yerkes under such “greats” as Chandrasekhar, and how Bob absorbed all this theory while becoming attracted to observational astronomy, and particularly the power of spectral classification. Morgan, his advisor, also shared with Bob an unexpected and persistent interest: extragalactic spectra. Bob caught the keenness of Morgan to experiment with equipment and ideas so as to perfect and extend classification schemes, while giving careful attention to the quality of data and to their analysis, based on the fundamentals of firm spectral standards. Thus, Bob became an expert practitioner and ardent promotor of the “MK Process and Stellar Classification,” the title of a conference in 1983 at which both Morgan and Philip Keenan were present, and which proceedings he edited. As a postdoc in the stimulating environment of Mount Wilson and Palomar Observatories, with excellent access to observing, Bob pursued the spectroscopy of Mira variable stars. He paid particular interest to the aluminum oxide clouds that came and went in their atmospheres. For some of these variables, including Mira itself, the spectral signature of the clouds did not correlate with the change in the overall spectral type. Bob also continued his thesis-sparked interest in hot stars through collaboration with Schild and W. Albert Hiltner in classifying the spectra of all the southern OB stars in the Bright Star Catalogue. It is a tribute to Bob’s careful technique that in 1973 he discovered a Pure Helium Star, and characterized it accurately just from classification features, as attested later by Rolf Kudritzki working from high dispersion spectra and non-local thermodynamical equilibrium (NLTE) analysis. Bob also discovered the brightest-known Cataclysmic Variable (1983), and is well known for his support for then-student Ian Shelton in the discovery of Supernova 1987A. Bob successfully mentored a steady number of graduate students, among whom some had backgrounds that were non-standard. Characteristically, Bob began a sabbatical year (1990-91) with a month of intensive teaching at the Vatican Observatory Summer School. What a way to rest! The attraction to him was an international collection of keen graduate students who came simply to learn, without the incentive of grades. As Bob would say and put into practice, “One is responsible to oneself for what one learns.” Tributes from these varied students to his care and effectiveness are too many to include here, but their gratitude to Bob is heartfelt. A year after Bob joined the Department of Astronomy, it was awarded a grant to purchase a 60-cm telescope, which became the University of Toronto Southern Observatory (UTSO), located at Carnegie Institution’s Las Campanas site in Chile. Bob was made director of this remote telescope, and he realized that, with limited but effective instrumentation and location at a superb site, it could become enormously productive despite its very modest size. This proved very true both for faculty members and for students, the latter relying on the telescope for many quality theses based on their observations with it. This productivity depended on dedicated support by the David Dunlap Observatory staff, orchestrated by Bob. In the pre-internet days, Bob’s twice-weekly, scratchy radio contact with the observer at UTSO kept all this going. He clearly loved the telescope, later dedicated in 1992 as the Helen Sawyer Hogg Telescope, and became an advocate for small telescopes, allied to great imagination, to give the best science-for-the-dollar. Running in parallel with Bob’s research and teaching career was his passion for sharing his love of astronomy with the general public and for serving the amateur and professional community in many ways. Many colleagues relied on him for classifications of stars in which they had become interested and whose spectra could be found in his considerable archive. 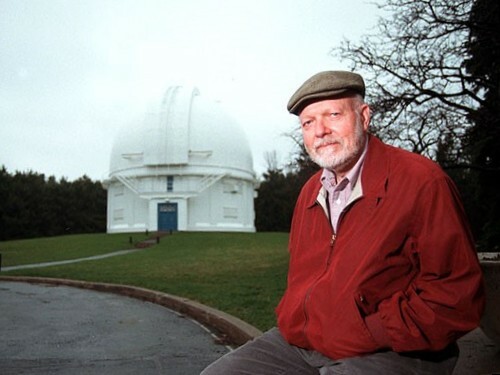 Bob was President of the Royal Astronomical Society of Canada (2000-02), President of the Royal Canadian Institute (1993-94), and President of the International Astronomical Union’s Commission on Stellar Classification (1985-88). In 2003, he was honored to receive the Queen’s Golden Jubilee medal for service to Canada. He regularly gave papers at American Astronomical Society meetings. His colleagues always enjoyed seeing him at such meetings, both for the intellectual stimulation he contributed and for his deep humanity and mischievous humor. A memorial gathering was held for family, friends, and colleagues on 14 October 2017 at Massey College on the University of Toronto campus. Obituary Written By: Christopher Corbally (Vatican Observatory; University of Arizona), based in part on an obituary in The Globe and Mail, Toronto, prepared by his family, and in part on a description of Bob’s career prepared by John Percy for the University of Arizona. Robert (Bob) Frederick Garrison was a gifted astronomer who was also a masterful spokesman for his discipline, opening up the splendours of the heavens to non-scientists in Canada and abroad. His infectious enthusiasm for the stars was transmitted not just to undergraduates and graduate students, but to the community at large. Garrison, who died in August of this year, was a long-time professor in the University of Toronto’s department of astronomy and astrophysics. His focus was on star classification and spectral analysis, the study of the radiation given off by stars and what characteristics can be gleaned from that data. Among his breakthroughs was the discovery of a pure helium star, and he was the supervisor of astronomer Ian Shelton, who in 1987 detected the brightest supernova observed from Earth in several centuries. Garrison had a key role as media gatekeeper after Shelton’s discovery of Supernova 1987A generated huge interest worldwide. He arranged public events and answered endless questions from the press. “Bob was soft-spoken but a very good spokesman… and was the perfect liaison for U of T,” Shelton says. Garrison died on Aug. 13 at the age of 81. He leaves his partner Susanna Jacob, children Forest Lee, Alexandra and David Charles, and three grandchildren. He was born on May 9, 1936, in Aurora, Ill, a western suburb of Chicago. At West Aurora High School he met the woman who would become his first wife, Ada Mighell. After serving in the United States Marine Corps for two years in the mid-1950s, he followed Ada to Earlham College in Richmond, Ind., where he earned his first degree, a bachelor’s in math. That’s where he whetted his interest in astronomy, following up with a degree in physics at the University of Wisconsin, then a PhD in astronomy at the University of Chicago. He did a postdoctoral fellowship with the Carnegie Institution in California, working at the historic Mount Wilson and Palomar observatories, before bringing his young family across the continent by car in 1968 to settle in at the University of Toronto, where he would stay for four decades. Garrison was intent on spreading the joys of astronomy to undergraduates and non-scientists. He enthusiastically taught the popular introductory Astro 101 course for non-science students, where he left them “with a good lasting impression of astronomy and astronomers,” says his long-time departmental colleague John Percy. In the early 1970s Garrison helped develop and teach an interdisciplinary course called Life on Other Worlds, which examined whether life was possible somewhere else in the universe. “At the time it was kind of New Age-y, but now it is mainstream stuff,” Percy says. The course is still being taught at U of T.
He also explained astronomical issues at public lectures, supported amateur astronomy, and was active in – and served as president of – both the Royal Canadian Institute and the Royal Astronomical Society of Canada. Garrison’s most gratifying teaching experience, according to his family and colleagues, was the month he spent in 1990 at the Vatican Observatory summer school. About two dozen highly motivated students from around the world attended the annual session at the church-backed facility in Italy. But there was no grading of their work. Garrison was energized by the students’ pure enthusiasm and commitment to astronomy, unencumbered by worries about marks. Garrison was the driving force behind the construction of a U of T-owned telescope in the mountains of northern Chile. Soon after he joined the university, he led an expedition to the proposed site, then persuaded his department to invest in the project because of its crystal clear view of the skies of the southern hemisphere. He directed the operations there and travelled to Chile frequently. After 26 years of productive research – including the 1987 supernova discovery – the University of Toronto Southern Observatory site closed, but Garrison was determined the telescope would continue its valuable work, so he arranged that it be dismantled and transported to Argentina for use in that country’s astronomical research. While Garrison was dedicated to his scientific work, he also had many other interests. He was a keen photographer and used a large format camera to take portraits. He was an avid canoe tripper, loved the opera, and sang in a choir for years with Susanna.